French, floral, folksy and above all else, fancy – click through to reveal more on these darling little lamps. I can’t think of anything cosier than a soft ambient light that allows shadows to dance on the walls while showcasing beautiful printed paper. It’s what you get with these beauties from French brand Lumignonne. 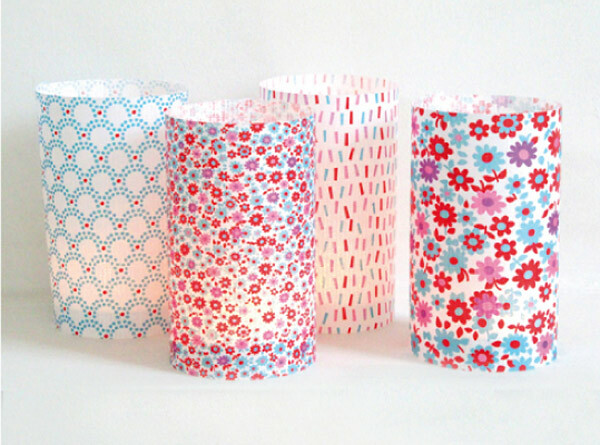 Each little lamp stands just twenty-one centimetres tall and is created by wrapping the pretty patterned paper card in a cylinder shape, fastening it and standing it over a tea light. There are seventeen designs to choose from, including my favourite three – Tin Toy, Folk and Paillettes – so you’re definitely spoilt for choice. While the French to English translation is a little sketchy, I’m assuming these paper lanterns are to be used with a tea light candle, but since we’re talking for children and in the interest of safety, I’m going to suggest you use a battery operated tea light, like the ones sold at Target stores. Lumignonne lamp paper and card are sent flat in a gorgeous matching envelope and include a fastening brad, priced €5 each from Fifi Mandirac.